An exceptional club that sets the standard for sailing activities, membership enjoyment, facilities and value. 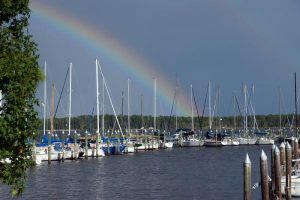 Blackbeard Sailing Club (BSC), is a private sailing club on Upper Broad Creek off the Neuse River and close to New Bern, North Carolina. Lat/Long is N35o 03.75 W76o 56.85. We are about 16 miles from the Intracoastal Waterway and 8 miles from downtown New Bern. Give visitors to this site an orientation to our club, our facilities, range of activities both on and off the water and our membership application process. It is also designed to give members access to password-protected information such as club calendars, events, service requests, merchandising, and member contact data. All of which is not available to the general public. Whichever category you fit into, please feel free to look around our site! “The vision of BSC is to promote the sport of sailing in and around the waters of Eastern North Carolina. Our club organizes, supports, and encourages participation in all aspects of on the water sailing-related activities. We also enjoy the social friendships developed and maintained by sharing our common love of sailing at shore side events. This web site is provided by Blackbeard Sailing Club solely as a convenience and no warranty, express or implied, is made regarding the information contained herein. BSC, its members and volunteer webmaster shall bear no liability for any losses directly or indirectly related to or involving the use or misuse of information contained in this web site.